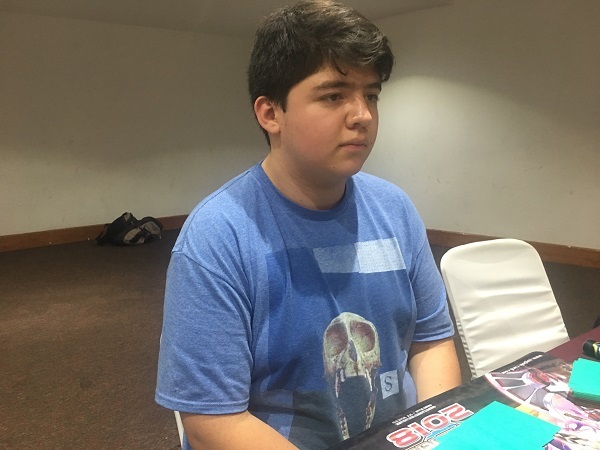 Jose Jesus Arroyo Sandoval is currently 5-1 in the Central America WCQ using his Paleozoic Dinosaur Deck, and now he’s facing off against Rene Francisco Gonzalez Pacheco and his Sky Strikers in this Round 7 Feature Match! Day 1 is almost complete, and both Duelists are looking to build as strong of a record as possible going into Day 2. It’s time to Duel! Gonzalez activated Foolish Burial Goods to send Sky Striker Mobilize – Engage! from his Deck to his Graveyard and then Summoned Sky Striker Ace – Raye. He used it to Link Summon Sky Striker Ace – Kagari and then activated Kagari’s effect to return the Engage in his Graveyard to his hand. He activated the Engage to add Sky Striker Mecha – Widow Anchor to his hand, prompting Arroyo to send Droll & Lock Bird from his hand to his Graveyard to prevent Gonzalez from adding any other cards from his Deck to his hand during the turn. Gonzalez Set 2 cards to his back row before passing. Arroyo drew a card and then had Terraforming, Megalosmasher X, Anti-Spell Fragrance, Souleating Oviraptor, and Paleozoic Marrella in his hand. He activated Terraforming to add Lost World to his hand and then activated Lost World. He Normal Summoned Megalosmasher X and used Lost World to give a Jurraegg Token to Gonzalez. He attacked the Token and then used Lost World to send Babycerasaurus from his Deck to his Graveyard instead of destroying it. He used his Babycerasaurus’s effect to Special Summon Oviraptor from his Deck, and added Miscellaneousaurus from his Deck to his hand with his Oviraptor’s effect. Oviraptor attacked and destroyed Kagari, and then Arroyo used the effect of the Raye in his Graveyard to Special Summon it to his field. He then used the effect of his Oviraptor to destroy Gonzalez’s Jurraegg Token and Special Summon Babycersaurus from his Graveyard. Arroyo combined his Megalosmasher X and Oviraptor to Xyz Summon Tornado Dragon, and Arroyo used Raye’s effect to Tribute it and Special Summon a monster. Arroyo Chained the effect of Tornado Dragon, targeting a face-down Widow Anchor, and then Gonzalez Chained the Widow Anchor, targeting Tornado Dragon. Arroyo Special Summoned Sky Striker Ace – Shizuku from his Extra Deck when the Chain resolved. Arroyo Set 2 cards to his back row and ended his turn. In the End Phase, Gonzalez added Sky Striker Mecha Modules – Multirole to his hand with the effect of Shizuku. Gonzalez drew a card and Arroyo flipped Anti-Spell Fragrance to slow him down. Gonzalez flipped a Widow Anchor to negate Tornado Dragon’s effect and take control of it, and then combined Tornado Dragon with Shizuku to Link Summon Knightmare Phoenix. He used its effect by discarding Droll & Lock Bird to try to destroy Anti-Spell Fragrance, and Arroyo Chained Paleozoic Marrella to send Survival’s End from his Deck to his Graveyard. Anti-Spell Fragrance was destroyed, and Gonzalez activated Sky Striker Mecha Modules – Multirole! Arroyo banished Survival’s End from his Graveyard to destroy Multirole and his own Babycerasaurus. He used Babycerasaurus’s effect to Special Summon Oviraptor to his field and used his Oviraptor’s effect to add Ultimate Conductor Tyranno to his hand. Gonzalez continued with his turn by activating Sky Striker Maneuver – Afterburners!, destroying Oviraptor and Lost World. He attacked directly with Knightmare Phoenix before ending his turn. Arroyo Summoned Souleating Oviraptor, and Gonzalez used Effect Veiler; but Arroyo Chained Miscellaneousaurus from his hand, protecting the Ovirpator’s effect and prompting Gonzalez to concede the Duel. Jose Jesus Arroyo Sandoval wins the first Duel with his Dinosaurs! 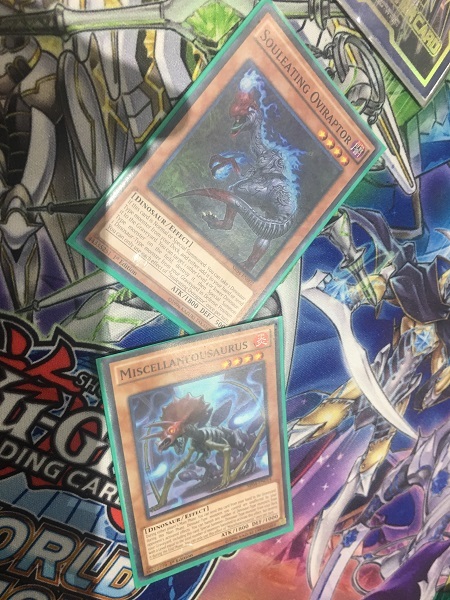 Gonzalez started off Duel 2 by activating Foolish Burial Goods to send Metalfoes Fusion from his Deck to his Graveyard. He activated Sky Striker Mobilize – Engage! to add Sky Striker Mecha – Hornet Drones to his hand, and then used Upstart Goblin to draw a card and give Arroyo 1000 Life Points. He activated another copy of Engage next, adding Multirole from his Deck to his hand and drawing a card. He activated the Multirole and then activated Sky Striker Airspace – Area Zero. He destroyed Area Zero with Multirole to Special Summon Sky Striker Ace – Raye from his Deck, and then used Raye to Link Summon Sky Striker Ace – Kagari. He used Kagari’s effect to add Engage from his Graveyard to his hand, and then used Engage to add a Sky Striker Mecha – Widow Anchor from his Deck to his hand and draw a card. He Set 3 cards face-down, and then Link Summoned Sky Striker Ace – Shizuku by using Kagari as a Link Material. In the End Phase, he used Multirole to Set an Engage from his Graveyard to his field, and added Sky Striker Maneuver – Afterburners! from his Deck to his hand with the effect of Shizuku. In the End Phase, Arroyo sent Ghost Reaper & Winter Cherries from his hand to his Graveyard to banish all copies of Kagari from the Extra Deck. Arroyo drew a card for his turn and then had Survival’s End, Megalosmasher X, and 3 copies of Souleating Oviraptor in his hand. He Summoned an Oviraptor and activated its effect; but Gonzalez flipped Widow Anchor to negate the effect and take control of it. Arroyo Set Area Zero to his field with the effect of Multirole in the End Phase. Gonzalez activated Afterburners to clear Arroyo’s field and then used Engage to add Sky Striker Mecha – Shark Cannon to his hand and draw a card. He activated the Shark Cannon to banish Oviraptor and then attacked directly with Shizuku. He Set Engage and Widow Anchor from his Graveyard with Multirole in the End Phase. Arroyo drew Ultimate Conductor Tyranno and then Normal Summoned another Oviraptor. He activated its effect, but Gonzalez Chained Widow Anchor once again. Arroyo Chained the effect of Survival’s End, destroy his Oviraptor and a face-down Shared Ride on Gonzalez’s field. Arroyo sent Giant Rex to his Graveyard with the effect of his Oviraptor. He banished it along with the Oviraptor to Special Summon Ultimate Conductor Tyranno from his hand, and then Special Summoned Giant Rex to his field. Ultimate Conductor Tyranno attacked and destroyed Shizuku, and then Giant Rex was unable to attack due to its effect. Gonzalez activated Area Zero and used its effect, but none of the top 3 cards of his Deck were Sky Striker cards. He activated Sky Striker Mobilize – Engage! next, adding a Widow Anchor to his hand and drawing a card from his Deck. He activated Afterburners to destroy Ultimate Conductor Tyranno and then used Hornet Drones to Special Summon a Sky Striker Ace Token to the field. He used it to Link Summon Sky Striker Ace – Shizuku and then shuffled Metalfoes Fusion from his Graveyard into his Deck to draw a card. He activated Widow Anchor to negate the effect of Giant Rex and take control of it, and then combined it with Shizuku to Link Summon Knightmare Phoenix. He attacked directly with the Phoenix and then Set 3 Sky Striker Spell Cards from his Graveyard with the effect of Multirole. Arroyo drew Paleozoic Marrella and then Normal Summoned Megalosmasher X. He attacked Phoenix with it to destroy the Phoenix and then Set Marrella to his back row. Gonzalez activated Afterburners to clear Arroyo’s field, and Arroyo Chained his Marrella to send Suvival’s End from his Deck to his Graveyard. Gonzalez activated the effect of Area Zero next, destroying his Shared Ride and adding a Sky Striker card to his hand. Gonzalez activated Hornet Drones next, and Special Summoned a Token to the field. He then used Multirole to destroy Area Zero, banishing it from the Duel. Gonzalez used his Token to Link Summon Shizuku next, and then activated Shark Cannon to Special Summon Megalosmasher X to his field. He Normal Summoned Raye next, and then Shizuku, Raye, and Megalosmasher X attacked directly, dropping Arroyo down to 1600 Life Points. Gonzalez combined his 3 monsters to Link Summon Knightmare Unicorn in Main Phase 2. He Set Afterburners from his Graveyard in the End Phase with the effect of Multirole. Arroyo drew Terraforming and activated it to add Lost World to his hand. He activated Lost World and then Summoned Oviraptor. He activated the effects of Oviraptor and Lost World, but Gonzalez negated Oviraptor’s effect with Ash Blossom and Chained Twin Twisters to destroy Lost World. Gonzalez flipped Afterburners to destroy Oviraptor, and Arroyo Chained the Survival’s End in his Graveyard to take down the Unicorn with it. He Set a card with Multirole in his End Phase. Arroyo drew a monster and Set it. Gonzalez activated Sky Striker Mecha – Hornet Drones to Special Summon a Token to the field and then used that Token to Link Summon Link Spider. He attacked Arroyo’s face-down Ghost Reaper & Winter Cherries, flipping it face-up and losing 800 Life Points. He Set another Hornet Drones from his Graveyard with Multirole in the End Phase and then passed. Arroyo drew Babycerasaurus and Set it. Gonzalez used Foolish Burial Goods to send Metalfoes Fusion from his Deck to his Graveyard and then time in the round was called! 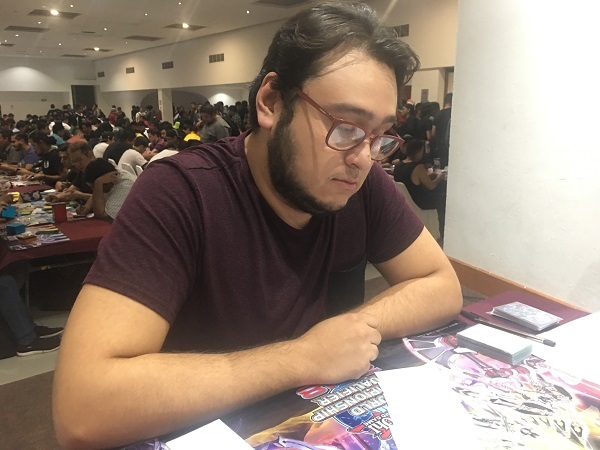 Since Gonzalez was ahead 5900 Life Points to 1600 Life Points, Gonzalez was declared the winner of the Duel! Since each Duelist had 1 win, the Match was a draw! Jose Jesus Arroyo Sandoval and Rene Francisco Gonzalez Pacheco are each advancing with a 5-1-1 record!